There are two types of domains on a cPanel box that can have document roots: Main (primary) domains and Add-on domains. cPanel’s default primary domain’s document root is: /home/USERNAME/public_html. We need to configure your server/domain’s document root to the /home/USERNAME/public_html/public. 3. Save it and exit. Changing the document root for Add-on domains is easy. 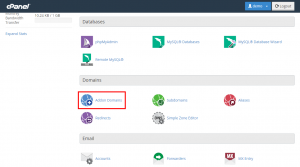 Simply log into your cPanel and navigate to: Domains >> Add-on domains. Next, edit the Add-on domain path. To do so, simply click the “Edit” icon next to the path, and type in your new path. It’s that simple!